The London Tavern, including the three brick wings of the former hotel, built in stages in 1859, 1860-61, 1863-64 and 1865-66, and the 1862 brick bath house in the courtyard. The London Tavern was built in stages between 1859 and 1866 by William Thompson Soulby (1830-1916), who was born in Lincolnshire and came to Beechworth in 1856. Gold had been discovered in the area in 1852 and the town grew rapidly to become the main town in north-east Victoria. Soulby purchased land in Camp Street in 1857, and in 1859 built the first wing of the present building, facing Camp Street. No architect is known. 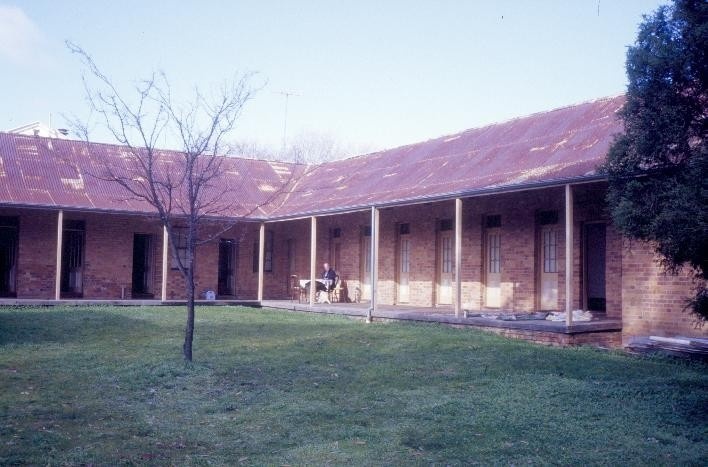 It was the first brick hotel in Beechworth, and had verandahs along the front and back, and a weatherboard kitchen and stables at the rear (now demolished). In 1860 Soulby added a dining room, and in 1860-61 an adjoining accommodation wing with several single rooms and a family room. In 1862 a detached brick bathroom building was constructed at the rear of the hotel, which was divided into two parts, part serving as a guest bathroom and part as a 'summerhouse'. In 1863-64 a second accommodation wing was added across the rear of the site, forming a three-sided courtyard with the bathhouse in the centre. The front wing was extended at the rear in 1865-66. The courtyard was planted with a garden. Soulby sold the hotel c1870, and under the ownership of Felix O'Connor in 1876-86 it was refurbished. For several years after 1909 it was known as the Federal Hotel. The last licence for the hotel was issued in 1912 to John Kelly, who in 1918 purchased the building. It was used as a family home until 1970, by which time the buildings were in poor condition. 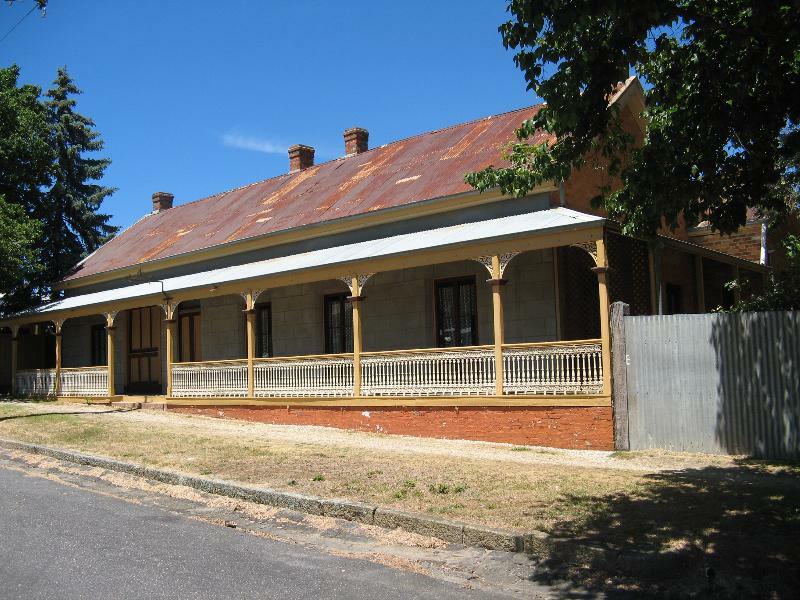 In 1970 it was purchased by a syndicate of Melbourne academics and friends with close associations with the National Trust and a great interest in the heritage of Beechworth, with the aim of conserving the buildings. The Former London Tavern is a complex of brick buildings with corrugated iron roofs, occupying part of a large corner site. The former hotel is made up of three single-storey brick wings enclosing three sides of a grassed courtyard, with a brick bathhouse in the centre. The front wing (1859, extended at the rear in 1865-66) originally contained the hotel's public rooms, including bars and a dining room, as well as bedrooms. This wing is largely surrounded by verandahs, and the front verandah on Camp Street has cast iron balustrading and brackets, a wide shuttered window opening into the bar and French doors opening into the other rooms. The front wing retains original features such as fireplaces, doorways, some original wallpaper, painted finishes and shingles beneath the corrugated iron roof. The cellar beneath the former bar area has an entrance under the rear verandah. The east wing (1860-61) included a dining room and several bedrooms, and the south wing (1863-64) also had bedroom accommodation. These rooms open off the verandahs (which have been widened) facing the courtyard. 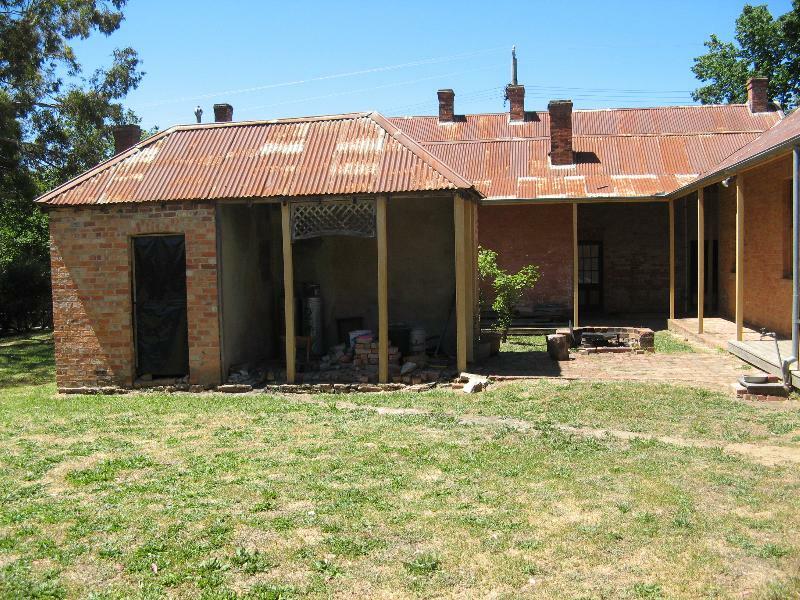 The bath house is a brick building with shingles beneath the corrugated iron roof. At one end is an enclosed room, used as a bathroom, and next to it an open section which may have been used as a washhouse and drying area, rather than as a summerhouse. 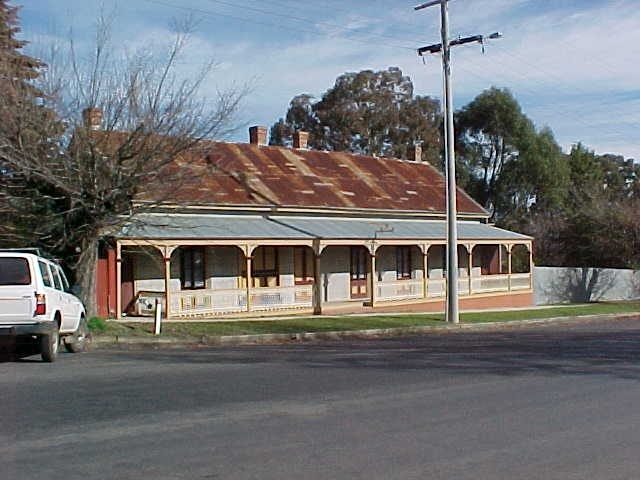 The London Tavern is significant as one the first brick hotel in Beechworth, and one of the most popular hotels on the local goldfields in the late 1850s and 1860s. It is one of a number of hotels built in Beechworth from the 1850s and is illustrative of the need for such facilities in the town. The restored street facade is an important part of the Camp Street streetscape. It is significant for its association with William Soulby, the first owner, a prominent local resident and businessman who arrived in Beechworth in 1856. 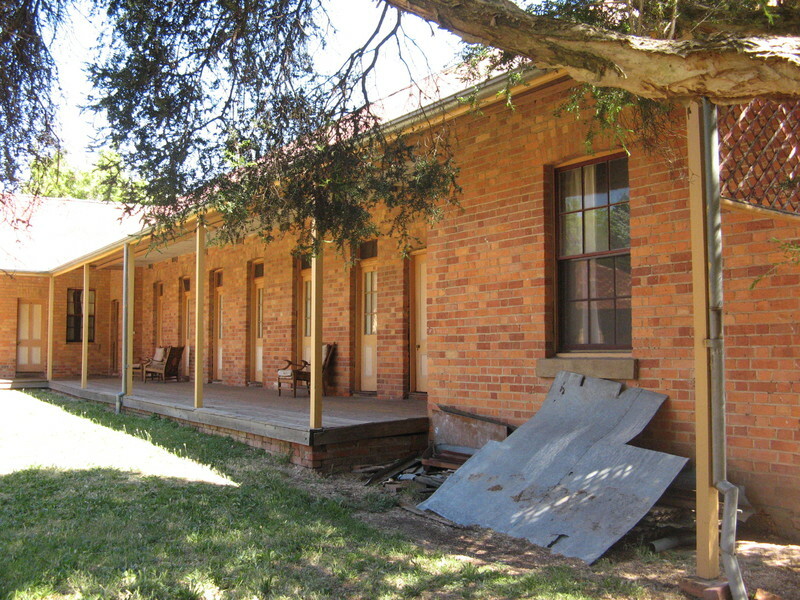 The complex is significant for its association with the early activities of the National Trust in Beechworth and with a number of early activists in the heritage and urban conservation movement, including George Tibbits, who was largely responsible for Victoria's first heritage area study: 'Beechworth - Historical reconstruction' (1976). As Executive Director for the purpose of the Heritage Act 1995, I give notice under section 46 that the Victorian Heritage Register is amended by modifying Heritage Register Number H350 in the category described as Heritage Place. All of the place shown hatched on Diagram 350 encompassing all of Lot Crown Allotments 19 and 20, Township and Parish of Beechworth. Beechworth owes its existence to the discovery of gold in 1852. The Beechworth area was first settled by squatters from 1837, but the discovery of gold resulted in a rush of miners to the area, with about 8,000 arriving by November of that year. The Ovens was an important river system in north-east Victoria and gave its name to the goldfields in this area. The town developed around the Gold Commissioner's Camp, established in 1852 on the granite hill on the north bank of Spring Creek. The township was first known as Mayday Hills, but when surveyed in 1853, it was named Beechworth. The main overland route between Melbourne and Sydney passed through the town until the 1870s (when the railway was built further to the west), and until then Beechworth was one of the richest towns in Victoria and the financial and administrative centre of the north-east . Until the mid-1850s most buildings in the town were constructed of wood, bark or canvas, but following the election of a town council in 1856 building regulations were introduced. Many of the town's major buildings were erected during the following five years, including the Ovens District Hospital (1856, VHR H358) and the Burke Museum (VHR H345, begun in 1857 by the Young Men's Association as a hall and library). The first town hall was built in 1859. 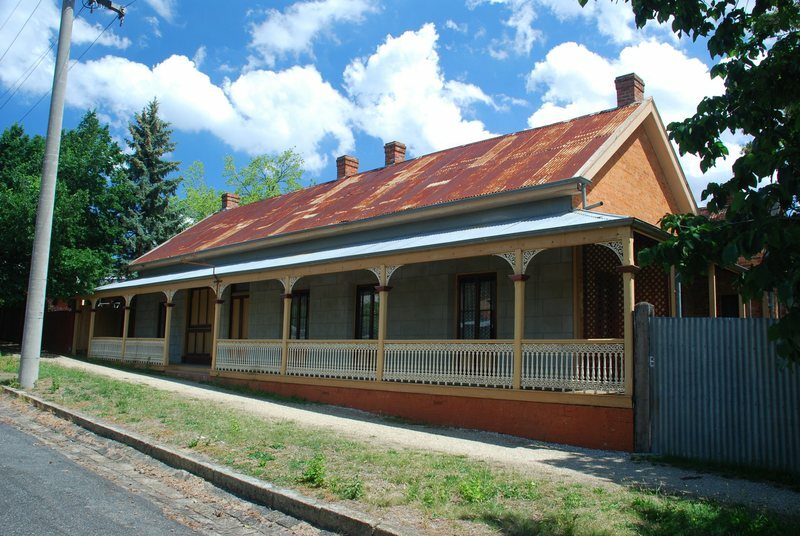 By the early 1860s a group of important administrative buildings, known as the Beechworth Justice Precinct (VHR H1464), had been completed along the south side of Ford Street, and a large gaol (VHR H1549) was begun to the north of this in 1858. The Beechworth Lunatic Asylum, later the Mayday Hills Hospital (VHR H1864-67), was built in 1864-67, and the landmark post office (VHR H867) was completed in 1870. The London Tavern was built in stages in 1859-64 by William Thompson Soulby (1830-1916). Soulby was born in Lincolnshire, and in 1853 migrated to Melbourne, where he was employed at the Melbourne Age. He came to Beechworth in 1856, working first as a compositor on the staff of the Ovens and Murray Advertiser. In 1856 he was married, and took over the Victoria Hotel and Dining Rooms in High Street. In January 1857 Soulby purchased the site of the London Tavern on Camp Street, and the first wing, facing Camp Street, was built in 1859. It was the first brick hotel in the town, and had a bar fitted 'in the London fashion', a 'superb suite of sitting rooms' as well as a private room, a lead lined 'shower bath', and had a charming exterior with French doors opening onto a promenade verandah. It was rectangular in plan measuring 63½ x 23 ft [19.4 x 7.0 m] with a cellar underneath, was built of double brick and had a shingled roof, later covered by corrugated iron. The bedrooms were in the back part of the building, and at the rear were stables and a weatherboard kitchen. A billiard room and washhouse were said to be under construction. By 1860 Soulby purchased an adjoining block of land. He added a dining room at the rear of the hotel, and in 1860-61 added at right angles to the first wing an accommodation block (90 x 16 ft [27 x 4.9 m]) containing single rooms and a family room. The Ovens and Murray Advertiser noted that the addition 'was being made to meet the rapidly increasing demand for hotel accommodation of a superior and safer description that that generally offered by the present buildings that are devoted to the travelling public'. Trees, mainly fruit trees, were purchased and a garden with a fountain was established in the courtyard. In 1862 a detached bathroom building, a most unusual feature on the goldfields at this time, was built in the courtyard. The agreement between Soulby and the builder notes that the bathroom building was to be 20 x 9 ft [6.1 x 2.7 m], built of brick and divided into two rooms, half to be a bathroom and half a 'summerhouse', and was to cost £36. The open area adjoining the enclosed bathroom is said to have been used as a washhouse and drying area. In 1863-64 a second accommodation wing was added, thus forming a courtyard enclosed on three sides with the bathhouse in the centre. In 1863 the hotel was referred to as the best hotel between Melbourne and Sydney (Ovens and Murray Advertiser, 26 May 1863), and was the preferred accommodation for visiting dignitaries, including Sir Redmond Barry and Sir William Stawell, who preferred to stay in the hotel than in the Judge's Rooms provided at the Courthouse. Soulby's obituary notes that after selling the London Tavern Soulby built the Post Office Hotel in Camp Street, which he conducted successfully for a number of years. In 1869-70 the licensee of the London Tavern was Thomas Wilkinson, and in 1870-76 it was John Rawlings. At this time the hotel appears to have become less respectable. The Ovens and Murray Advertiser (13.12.1873) records a court case headed 'Attempt to entrap female servant', in which a new servant noted that she had observed 'improprieties' at the hotel, and that the daughter of her employer had 'got money and rings from men for immoral purposes'. Felix O'Connor owned the hotel from 1876-86. He refurbished the buildings, revamped the hotel gardens, and removed the original stables at the rear of the first hotel wing. Under O'Connor the business did not do well, there being a general economic downturn at the time, and he also had to compete with the new Tanswell's Hotel, built in 1878. There were a number of licensees in the following decades. By 1909 the hotel name had been changed to the Federal Hotel, and the last license for the operation of the hotel was issued in 1912 to John Kelly. In 1918 Kelly purchased the freehold and it became a family home for Kelly and later for his children. During this time the condition of the hotel buildings deteriorated. 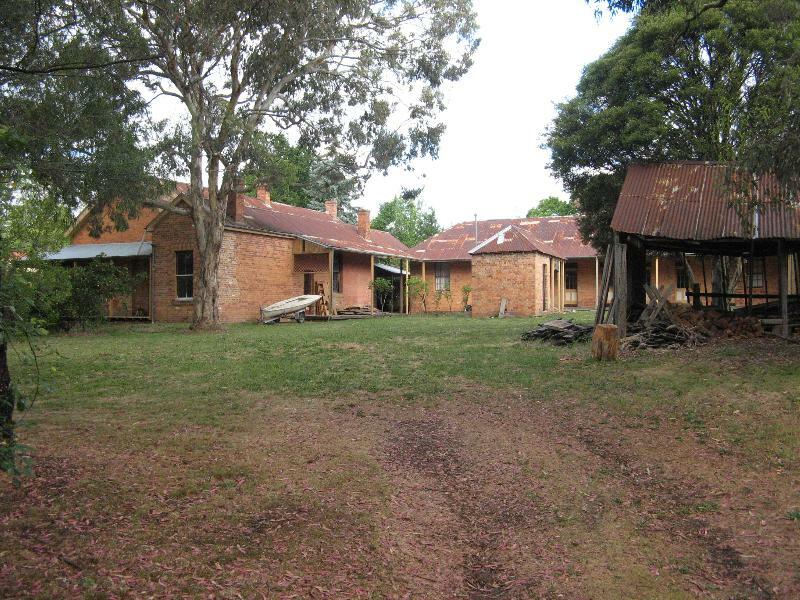 The former hotel was in poor condition when it was purchased In 1970 by a syndicate of nine Melbourne friends, mostly academics from Melbourne and Monash Universities with close associations with the National Trust and an interest in conserving Beechworth's heritage. The syndicate was made up of Alan Beever, Chris Wallace-Crabbe, Frank Eastwood, John Loder, Barrie Milne, Kevin O'Neill, Frank Strahan, George Tibbits and Bob Wilson. George Tibbitts was a teacher of urban studies and architectural history at the University of Melbourne who initiated the first area heritage study in Victoria, the Beechworth Historical Reconstruction Project (1976). During the following decades the group carried out extensive conservation works at the old hotel, and used the place as a holiday and work centre for themselves and their families. The former hotel continues to be used (2014) by the second and third generations of the families. G F Craig, 'The London Tavern, Camp Street, Beechworth', unpublished manuscript, 1999 (in SLV collection). Joan Hildebrand, 'A History of the London Tavern, Beechworth', Beechworth 2007 (in SLV). Oven and Murray Advertiser, various dates. Accessed through the Trove database. 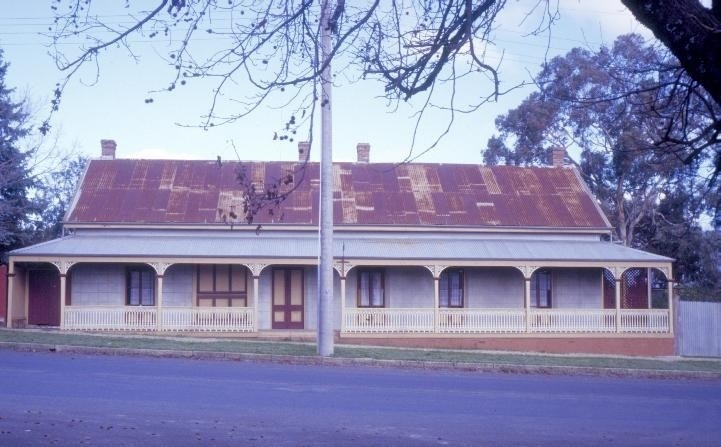 This intact example of an early goldfields hotel, built in stages between 1859 and 1864, was the first brick hotel in Beechworth and was then the best hotel on the Ovens goldfields. It retains a unique 1862 brick bath house.
. Painting of previously painted walls and ceilings, except those with original paint finishes, provided that preparation or painting does not remove evidence of any original paint or other decorative scheme.
. Demolition or removal of non-original stud/partition walls, suspended ceilings or non-original wall linings (including plasterboard, laminate and Masonite), bathroom partitions and tiling, sanitary fixtures and fittings, kitchen wall tiling and equipment, lights and built-in cupboards. 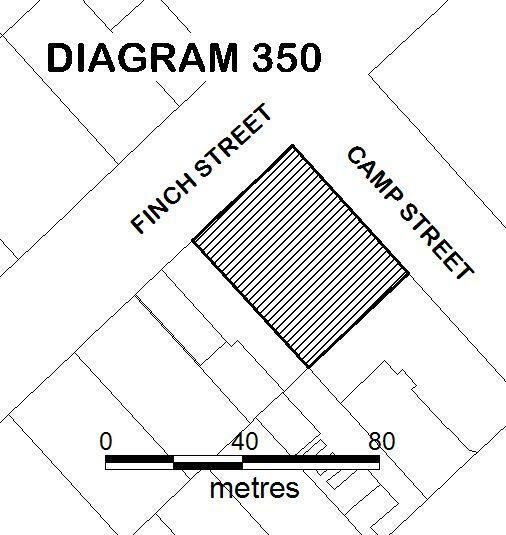 The extent of registration of the London Tavern on the Victorian Heritage Register affects the whole place shown on Diagram 350 including the land, all buildings, roads, trees, landscape elements and other features. Under the Heritage Act 1995 a person must not remove or demolish, damage or despoil, develop or alter or excavate, relocate or disturb the position of any part of a registered place or object without approval. It is acknowledged, however, that alterations and other works may be required to keep places and objects in good repair and adapt them for use into the future. 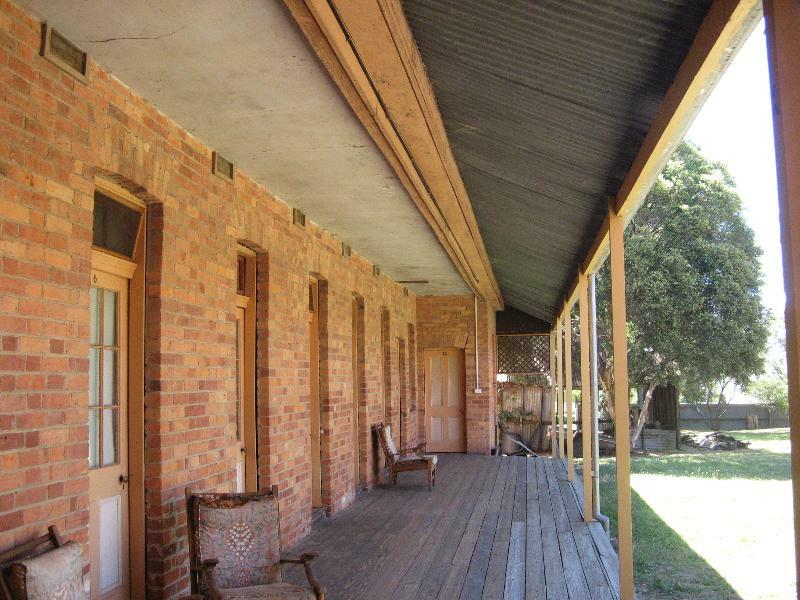 The cultural heritage significance of the London Tavern lies in its importance as an outstanding example of an early goldfields hotel, built in stages between 1859 and 1866. It retains the three original wings of the hotel, with the doors to all of the accommodation rooms opening off the verandahs around the courtyard. The bathhouse building in the courtyard is a most unusual feature and a very early example of a bathhouse structure, though no original internal features survive.